I’ve mentioned before that we are a mixed family when it comes to eating preferences. I am a vegetarian while Vishnu is a [white] meat/seafood guy. Sadly for him though, I’m not big into cooking meat at home. Quite honestly, it grosses me out. Plain and simple. He does get his fill with turkey sandwiches, any meals we eat out, and lunches served at school. But before y’all feel too bad for him, you should know that he eats plenty of delicious (or at least I think so) and protein filled veggie meals. In fact, just today he asked me to make the tofu meatballs from the other night again next week. That’s how I know something is good. And just so y’all know, I have about a 95% success rate when it comes to Vishnu’s taste buds. Not bad! So I found this recipe while searching for vegetarian meal ideas. It looked easy enough, was something different from our normal dinner eats, and sounded tasty. So I gave it a shot. As you can see from the picture above, I used quinoa as the base and topped it all off with some goat cheese. Next time I may use spaghetti squash and mozzarella to change things up a bit. Also, I didn’t have time to make the sauce from scratch, so I used a store bought Bertolli sauce. And I’m just going to warn all my meat loving friends – the tofu meatballs taste nothing like the real deal. They tasted more like little ricotta veggie burgers. All I have to say is yum. So without further ado, here’s my version of this great recipe. 1. In a large skillet over medium heat, add 1 tablespoon olive oil. 2. Add the onion, salt, and pepper. Cook until the onion is just starting to look transparent. 3. Add the mushrooms and garlic and cook another 2-3 minutes. 4. Add the soy sauce and hot sauce. Cook for another 2-3 minutes until the mushrooms start to soften up. 5. With a slotted spoon, transfer the veggies to a blender/food processor. Save the liquid. 6. Add the tofu, egg, bread crumbs, and Italian seasoning to the veggie mixture. Blend until combined. 7. Place the tofu mixture in the freezer for 5-10 minutes to harden. 8. Mix the jar of pasta sauce with the reserved liquid from the veggie mixture over medium heat. 9. Place a large skillet over medium heat. Add 1/2 tablespoon olive oil and also spray with a little bit of cooking spray. *10. Sprinkle flour on a plate. Wet your hands with a little bit of water and scoop out 1 – 2 inch tofu balls. *11. Roll the balls in the flour. 12. Once ready, transfer balls to skillet and cook on each side for a few minutes or until brown. (You’ll likely have to do two large batches). 13. Place the tofu balls in the sauce and let marinate for 10-15 minutes. *The messy part of the process. When ready to serve, spoon some quinoa (or whatever base you choose) on a plate and top with tofu meatballs and sauce. Sprinkle your favorite cheese on top and enjoy! This recipe definitely got two thumbs up from both me and my meat eating husband! And as an added bonus, these tofu meatballs make great leftovers. See, I told you guys not to feel too bad for Vishnu!! If you have any delicious vegetarian recipes you’d like to share, PLEASE do so. I’m always on the lookout for new ones to try. Firstly I LOVE that you use the word y’all…makes me smile every time I read it! Between you cooking for Vishnu and his easy-to-please taste buds, I can’t decide who has it easier! 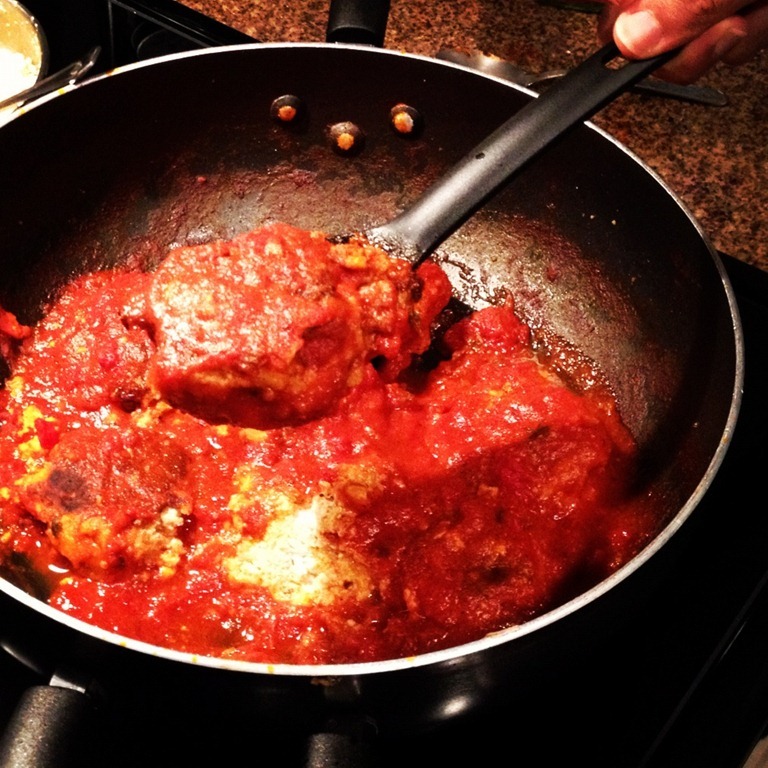 Either way, love the sound of these meatballs! And let’s be honest, any dish involving marinara sauce & cheese is bound to be a win! I actually haven’t had tofu in ages because I was bored of my usual sautéing/grilling way of eating it! I know I will be making this recipe sooner rather than later…perhaps Monday night? I would do so sooner but it looks like there is plenty of eating out this weekend for me! Haha! Y’all is the one thing that I consistently say that’s southern! Just can’t see to stop!!! And let me know if you make this. It definitely helped break the tofu routine for us…in a delicious way! I was going by what Vishnu said. 🙂 I honestly can’t remember the last time either! And yes, this was delicious! I like the consistency of yours! I think I’m going to add lentils the next time around. Thanks, Laura! You honestly can’t even tell that the meatballs are made with tofu. Vishnu thought they tasted more like ricotta cheese than anything else! Hi, have been following your blog for sometime now. But this is my first comment. We have the same issue at home..a carnivore husband and my daughter and I are vegetarians:) I use the Costco veggie(meatless) balls and serve over spaghetti when am cooking for a party. But your recipe sounds simple and healthy. Will try it soon. Hi there! I’ll have to check those veggie meatballs out! I love Costco. 🙂 And yes, this recipe turned out so well and tasted much more rich than it really was.